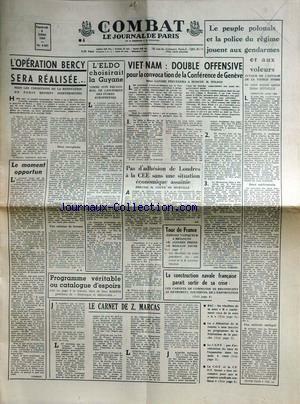 Partager la publication "COMBAT no:6867 20/07/1966"
LE PEUPLE POLONAIS ET LA POLICE DU REGIME JOUENT AUX GENDARMES ET AUX VOLEURS – VIETNAM – DOUBLE OFFENSIVE POUR LA CONVOCATION DE LA CONFERENCE DEGENEVE – L’OPERATION BERCY SERA RELIASEE – L’ELDO CHOISIRAIT LA GUYANE – PAS D’ADHESION DE LONDRES A LA C.E.E. SANS UNE SITUATION ECONOMIQUE ASSAINIE – TOUR DE FRANCE – JIMENEZ – JANSSEN – LA CONSTRUCTION NAVALE FRANCAISE – Z. MARCAS. 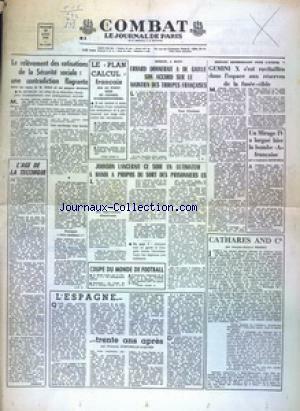 Partager la publication "COMBAT no:6867 08/07/1966"